We can’t deny that it’s one of the cutest sights in the world, well, along with these adorable kittens. But don’t you wonder why your cat does something so seemingly unusual? Well, today we’re going to talk about the reasons why your cat mimics a meerkat so successfully. 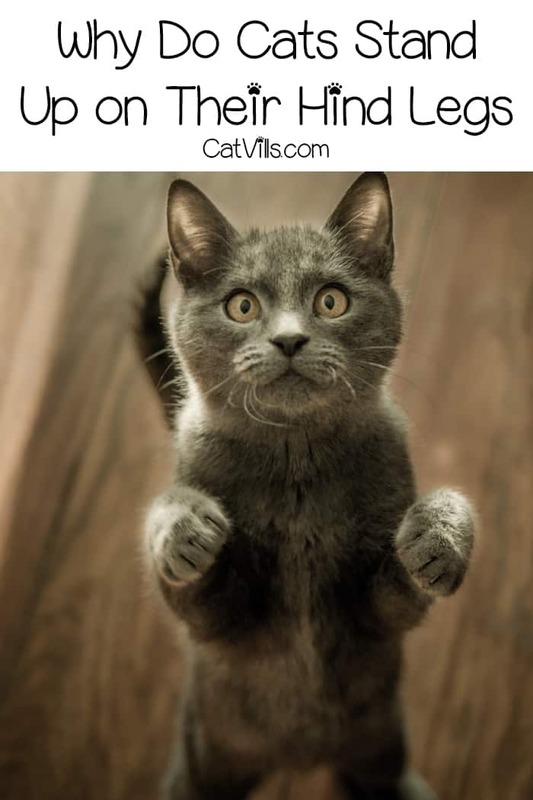 Read on to learn all about why cats stand up on their hind legs! Cats exhibit many behaviors that humans find baffling and unexplainable. I think that our pets do something weird just to sit back and watch as we scratch our heads what’s going on. Standing on their hind legs might be just one of them. However, cat experts have something to say on the matter. So, let’s discuss six possible reasons why your cat stands on its hind legs. I’m sure that you’ve seen at least one cat fight during your life. You’ve probably noticed how cats puff up their tails and try to appear more vicious to scare away their opponents. Well, standing on the hind legs is another tactic that cats use when they feel in danger or threatened by a predator. They do it to appear bigger than they actually are and to deceive the predator that they are dangerous. This behavior might seem funny to humans, but it actually works on some predators as much as you have a hard time believing it. There is nothing more adorable or fascinating than watching kittens chase each other around the house. You will notice that sometimes a kitten stands briefly on its hind legs before jumping on her sibling. The same happens when she is playing excitedly and throwing a toy around. It’s all part of the game! I remember when I started printing documents with the cat in the room. Kitty had never before heard the printer working, so she was completely baffled. She rose on her hind legs and observed it for a minute before hiding under the desk. I’ve also seen this behavior when there are strange noises outside, and the cat wants to check it out without being seen. I often call Kitty a “meerkat” when I see her doing this trick because she reminds me of Timon from The Lion King. So, Kitty might be curious about what is happening around her, but she is too afraid to come close to check it out. Instead, she will perch on her hind legs to assess the situation. 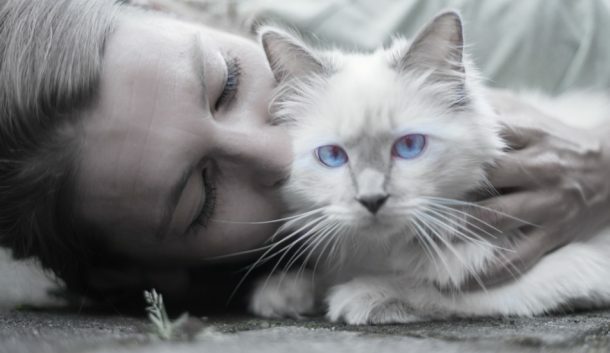 Cats are affectionate creatures, even though many people think otherwise. The truth is that they like to be petted but on their own terms. So, when the cat is rubbing her head against your leg and standing on her hind legs, it’s a clear sign that she wants you to look at her and pet her. Do it, or you might not get another chance! Let’s imagine something for a second. You’ve left a bucket of delicious chicken wings on the table. What would your cat do when she smells it? She will try everything possible to get it, including standing on her hind legs to reach the table. The same thing happens when you try to give her a treat. She quickly stands on her hind legs and takes it right out of your hand, barely missing your fingers. Sometimes even the sound of the bag treat is enough to get her to stand up and check what you’re holding. I’m giving you a bit of advice. You can use this to your advantage and train her to stand on command if you want to impress your friends. You’re probably already familiar with those cute videos of Munchkin cats standing on their hind legs. A reason exists why these adorable cats spend so much time sitting or standing on their hind legs. They have a genetic mutation, which resulted in short, stumpy legs. As a result, they have a low gravity center. Some cats born with disabilities also might learn to compensate by standing on their hind legs and hopping around like kangaroos. Just like these little guys Roux and Roo. Both were born without properly formed front paws, but they still live a full life. So, your cat might be standing on its hind legs due to any of the reasons we mentioned above. The important thing is that they look cute and irresistible, so take a photo of your cat standing on its hind legs and share it with us! What do you think about this peculiar cat behavior? 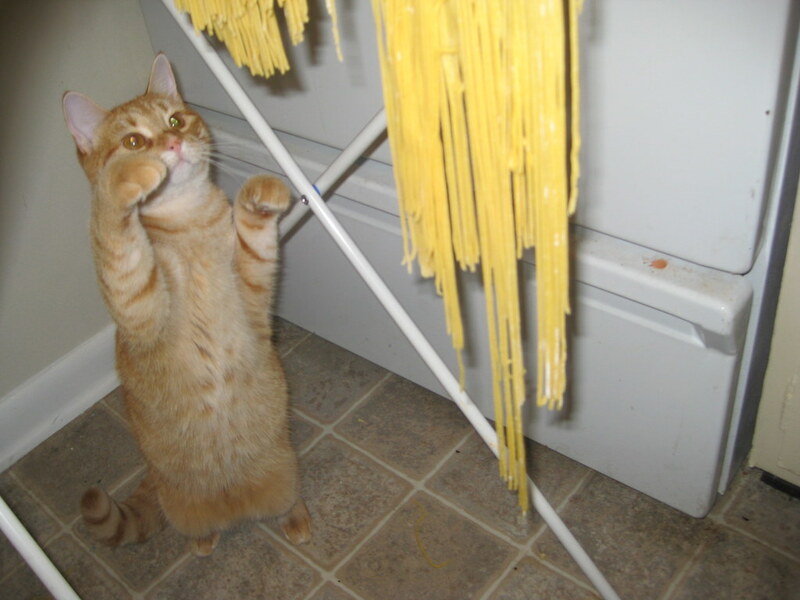 Why do cats stand on their hind legs according to you? Tell us what your hypothesis in the comment section. This was a very interesting read. I’ve always wondered why cats do this. I didn’t realize they did it when they were nervous. Whatever the reason cats stand on their hind legs, it’s totally adorable. Thanks for this great read. I had no idea why they stood on their hind legs, I just always thought the funny cat videos where they stood up and walked away were hilarious. 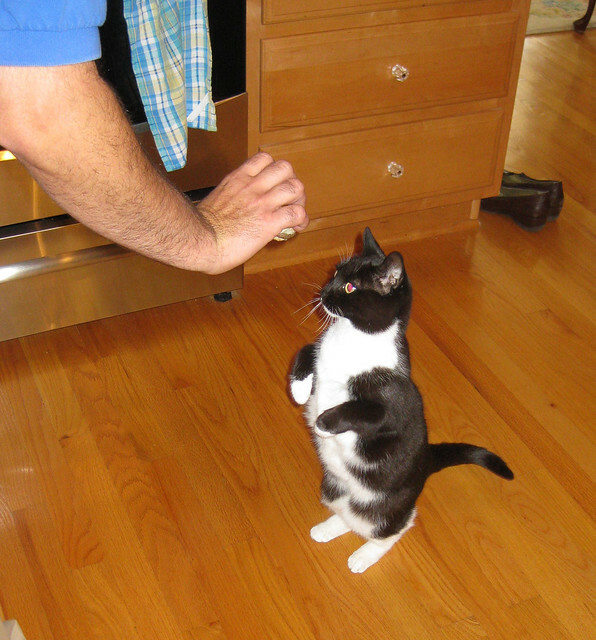 My in-laws cat always stands on her hind legs when it’s dinnertime, so I always assumed they did it just to get attention. Love this post! It is really interesting why cats do that. Thanks for the ideas! That munchkin cat is too cute! My cat usually stands when he wants food or attention. It’s so cute that they are trying to look bigger when they do this! I find cats absolutely fascinating and I seem to be learning so much about them – especially since this year because a lot of my friends just adopted cats of their own. Very neat. I’ve often wondered about this as we have 3 cats that sometimes do this. Very cool. This was such an adorable and informative article! Who knew! Fascinating read, I love learning about animal behavior. It’s interesting that cats stand for a bit when they are nervous. Cats do the strangest things. I love when they stand on their hind legs. It changes their whole appearance. I guess I never really wondered why cats stood on their hind legs, I just knew they did. I always thought it was just because they were trying to reach something. Thanks for sharing. I could watch all the cat videos! I hadn’t seen the videos of Roux and Roo, but they are so sweet. Love knowing why our animals do what they do!